The 2019 Festival Fanatic will receive a package of Kentucky Derby Festival prizes. LOUISVILLE, KY (WAVE) - Want to be a VIP at Derby festival events this year? Losing the lottery could be your ticket. 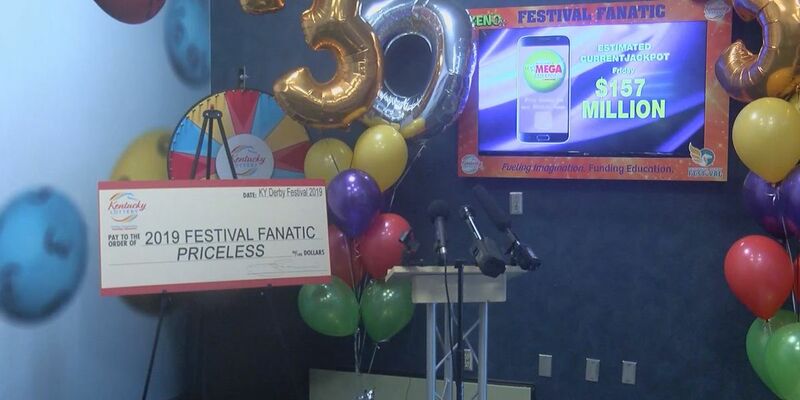 The Kentucky Lottery and the Kentucky Derby Festival have joined forces and formed a new contest, the winner of which will be named the 2019 Festival Fanatic. To enter, all you need is a losing KENO lottery ticket. The prize is a package of once-in-a-lifetime experiences, from being a VIP in the Pegasus Parade to seats on Millionaires Row for Celebrity Day. In total, eight different Derby Festival experiences are included. The prizes start with a rooftop view and front row seats to Thunder Over Louisville, followed by a a ride in a hot air balloon as part of the Great Balloon Fest. During the Pegasus Parade, the Festival Fanatic will ride down Broadway waving to the crowd as a VIP in the Pegasus Parade. The winner also gets $500 in spending money. Kroger’s Fest-a-Ville concert meet-and-greet on one day of choice (April 25 – May 3) and food vouchers for four (4). Four (4) Derby Festival Fuel Up Feast tickets and VIP viewing for the Great Balloon Glow on Friday, April 26th and Balloon Fest. Four (4) Derby Festival WineFest tickets, four (4) wine glasses, and four (4) WineFest event pins on day of choice (Tuesday, April 30 or Wednesday, May 1) at the Belvedere and an opportunity to meet the wine maker. Participants must be at least 21 years of age to participate. Four (4) Derby Festival Great Steamboat Race tickets on the Belle of Louisville, on Wednesday, May 1, 2019. Four (4) Derby Festival Celebrity Day at the Downs tickets on Thursday, May 2, 2019 and opportunity to sit near the Celebrities on Millionaires Row at Churchill Downs. One person will ride in the Pegasus Parade as a VIP, while three (3) guests have viewing access from the Review Stand on Thursday, May 2, 2019. Four (4) Thunder VIP Rooftop Party tickets. A hot air balloon ride for one (1) on a date mutually acceptable to the Festival Fanatic and the operator during the Derby Festival events (dates during BalloonFest events are excluded). The Festival Fanatic may designate a person other than himself/herself to take the balloon ride; however, the participant must be at least seven (7) years of age to participate. To play, you must sign up or register for the Kentucky Lottery’s “Fun Club” online or via the app. Registered users will be able to submit a losing KENO ticket worth $5 or more to enter the contest. Tickets purchased online are not eligible. The last day to enter is St. Patrick’s Day: Sunday, March 17, 2019. The winner will be selected in a drawing on Tuesday, March 19.